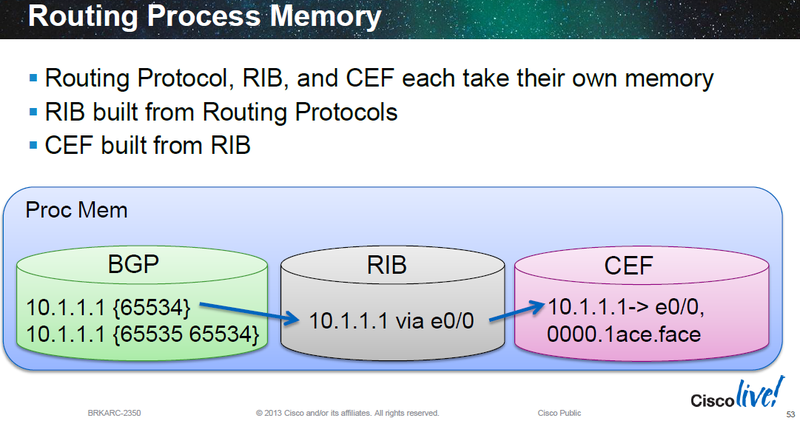 Protocol RIBs feed into the central RIB (with administrative distance acting as the tie breaker between multiple protocols offering the same route into the RIB) and then the RIB with the egress interface destination and L2 rewrite information are compiled into the FIB (in software). 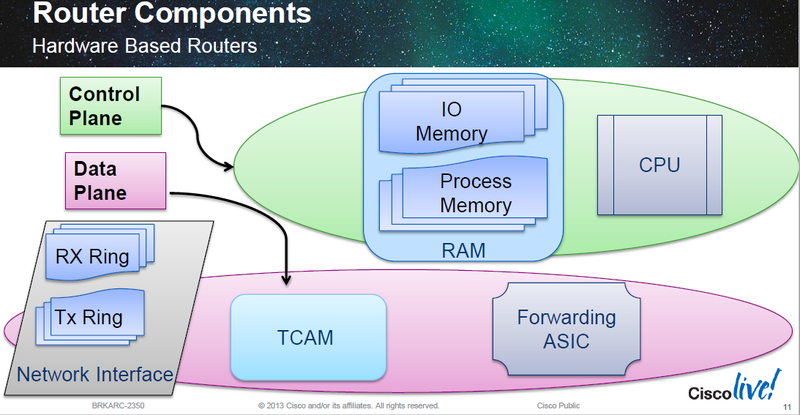 In hardware accelerated platforms (separate CPU for control place and hardware for the data plane) like the 6500/7600, Nexus 7000 or ASR9000 etc the FIB is then programmed into the hardware (typically TCAM). 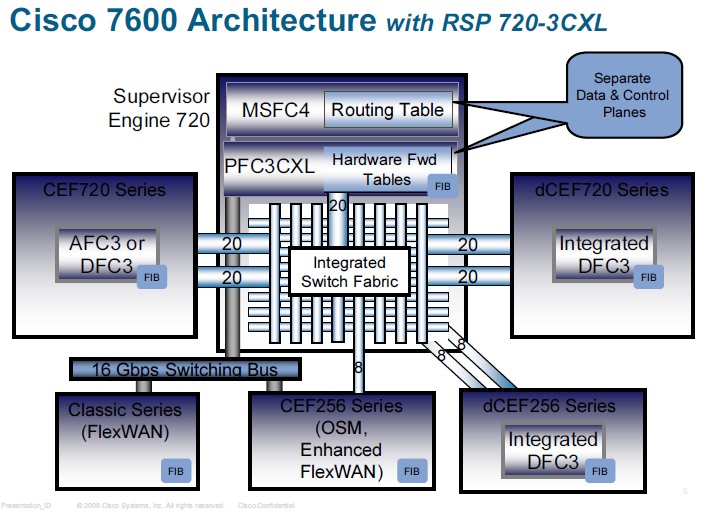 In routers like the 7600 the various parts of the forwarding are distributed amongst the various removable components within the chassis (the RSP, line cards and DFCs). Below the PFC on the RSP contains the FIB TCAM for forwarding, QoS TCAM and ACL TCAM. Packets that ingress a CFC line card query the TCAM on the PFC with the packet header used as the search query. The request is sent over the DBUS (data bus) and the result (egress port, header rewrite info etc) is returned over the RBUS (result bus). 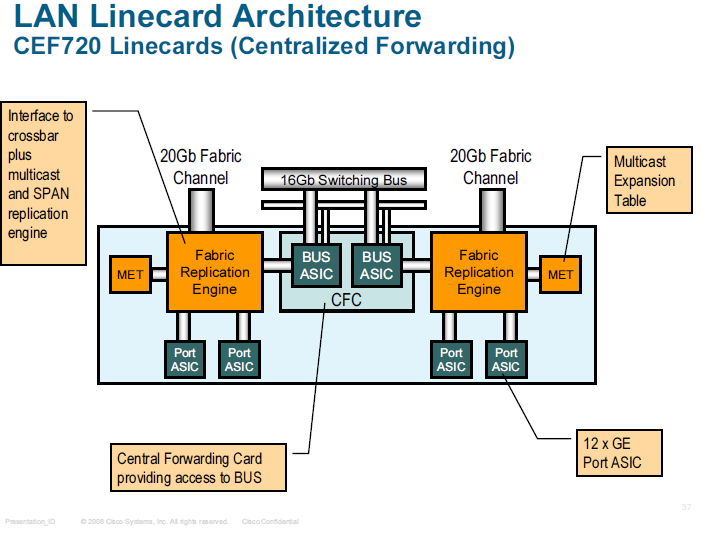 The ingress line card then packets the packet into a superframe and transmits it across the backplane fabric to the egress line card. For DFC enabled line cards a copy of the TCAM is placed directly on the line card so the egress lookup can happen on the packet ingressing line card. Above the MSFC is shown with the separate SP and RP that provide the L2 and L3 control planes. They both use the EOBC channel to communicate the PFC TCAMs. 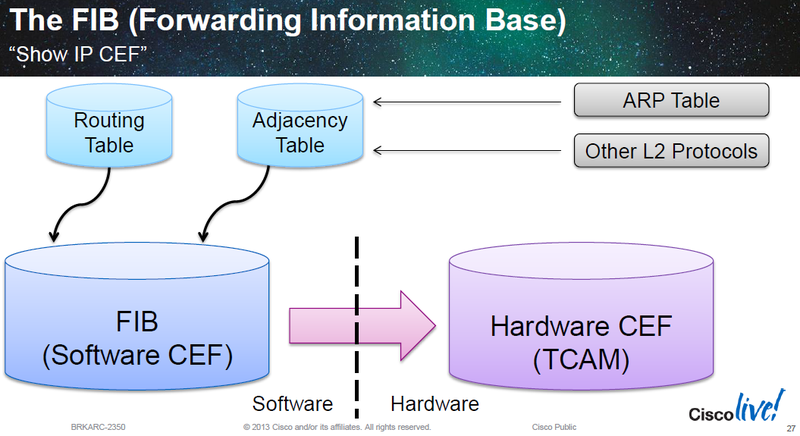 The MSFC builds the Cisco Express Forwarding information Base (FIB) table in software and then downloads this table to the hardware ASICs on the PFC and DFCs (if present) that make the forwarding decisions for IP unicast and multicast traffic. On the PFC3/DFC3 (EARL7) the Superman ASIC is the L2 forwarding engine and the Tycho ASIC is the L3 engine on the PFC. On the RSP720/PFC3C (EARL 7.5) the Superman and Tycho ASICs are squahsed into one called the Supertycho and another ASIC called Kuma is present providing the lookup bus functionality. Kuma 2 — Bus bridge/converter ASIC. Metro_Argos 2 — Metropolis Argos ASIC. Bridge between the port, fabric, and the forwarding engine. Metro_Krypton 2 —Metropolis Krypton ASIC. Interface ASIC that sits between a port ASIC and the EARL complex. SSA 2 — Super Santa Anna ASIC. Serial link transceiver back to fabric. R2D2 4 — Port interface ASIC. SSA 1 — Super Santa Anna ASIC. Serial link transceiver back to fabric. 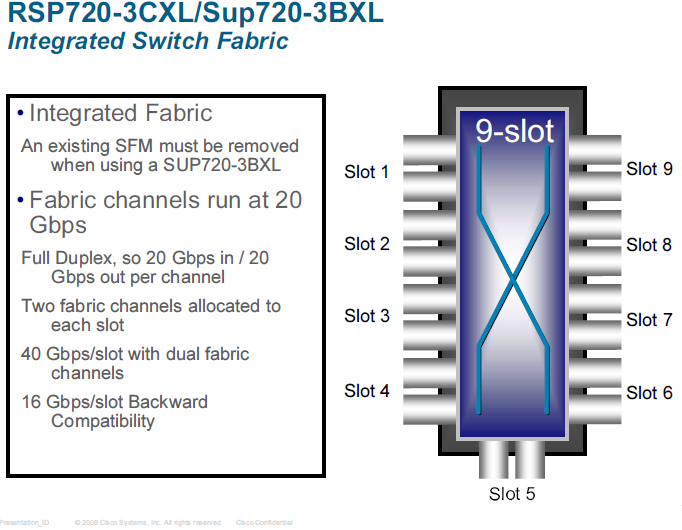 SSO 4 — Crossbar switch fabric ASIC. 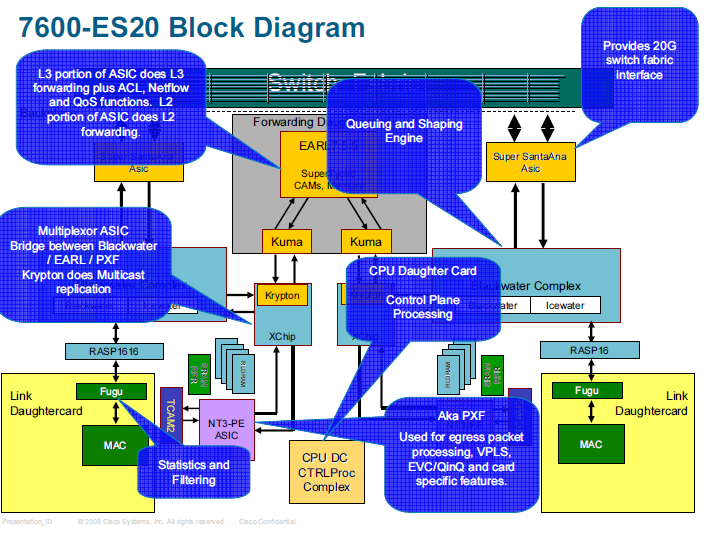 Eureka and Lamira ASICs = EARL8 chipset. In the WS-X6724-SFP, WS-X6748-SFP and WS-X6748-GETX a single "port" ASIC supports 12 local Gigabit Ethernet ports. In the WS-X6704-10GE line card, there are four port ASICs each supporting 1 x 10 Gigabit Ethernet ports. For WS-X6708-10GE cards there 8 port ASICs, each supporting 1x 10 Gigabit Ethernet ports. For the 48x1G card and 4x10G card the port ASIC is the ROHINI ASIC. On the 8x10G card it is the R2D2 ASIC. Two ROHINI's feed into one JANUS and each JANUS feeds into an SSA ASIC ("Super Santa Ana" which are 20Gbps switch fabric channel ASICs). For the WS-X6708-10GE there are 8x R2D2 port ASICs (ASIC per port) -> 4 Tiangang aggregation ASICs (port pair ASIC which aggregates 2x R2D2s into a single Metropolis ASIC channel instead of 1x R2D2 per Metropolis channel) -> Metro Argos (Metropolis Argos ASIC, bridge between the port, fabric, and the forwarding engine) -> 2 SSA ASICS (Super Santa Anna, fabric complex ASIC). The Metro Krypton ASIC (Metropolis Krypton) is an interface that sits between a port ASIC and the EARL complex and can handle Multicast. 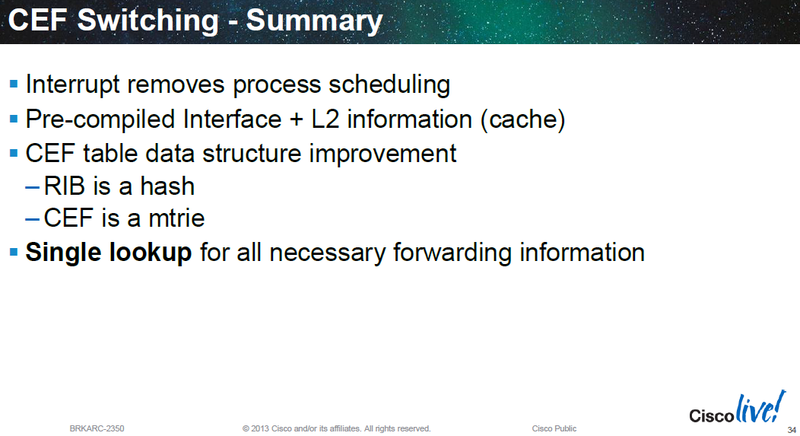 The Kuma ASIC handles the forwarding bus lookup. For the WS-X6716-10G two ports share a single 10G port ASIC (the NAXOS ASIC) and two port pairs (two NAXOS ASICs) feed into a single ASHWINI ASIC which is also 10Gbps. These feed into 4x R2D2 then 2x Metro Argos then 2x Super Santa Ana's. For the WS-X6908-10G each port has a Ganita ASIC which is the PHY ASIC, each GANITA feeds into one R2D2 port ASIC (10G ASIC). The ports are paired 1&2, 3&4 etc, and feed into port-group ASICs (Metro Argos). Metro Argos > SSA (Super Santa Anna) ASICs provide the fabric (serial) connection > feeds into the Santa Monica ASIC providing the backplane connectivity. 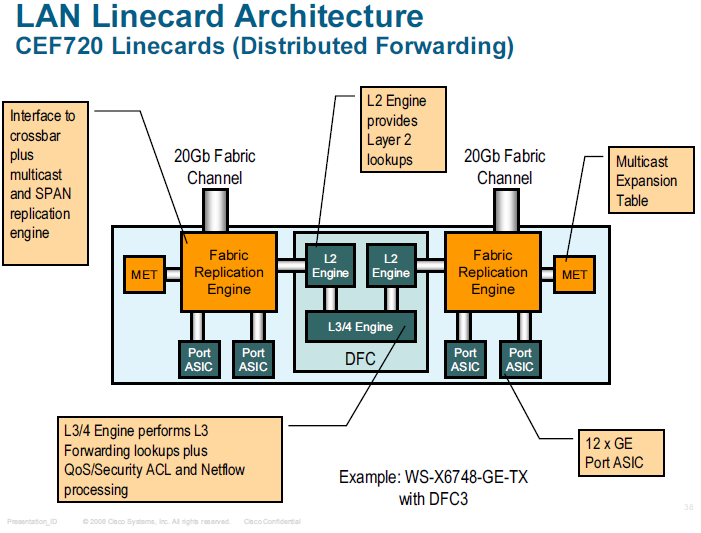 From the various supervisor line cards the SANTA_CRUZ and SANTA_MONICA ASICs are some how related to the forwarding (they provide the backplane connectivity). The Trident line cards in the ASR9000 series are based on the NP3C network processing unit used in ES+ line cards (so they are basically beefed up ES+ line cards) and use the SANTA_CRUZ ASIC. The Santa Cruz ASIC was replaced by the Santa Monica ASIC. The Santa Cruz was 20 ports, 20Gbps max each == 360Gbps total. The Santa Monica suports 26 ports, 40Gbps max each == 1040Gbps. 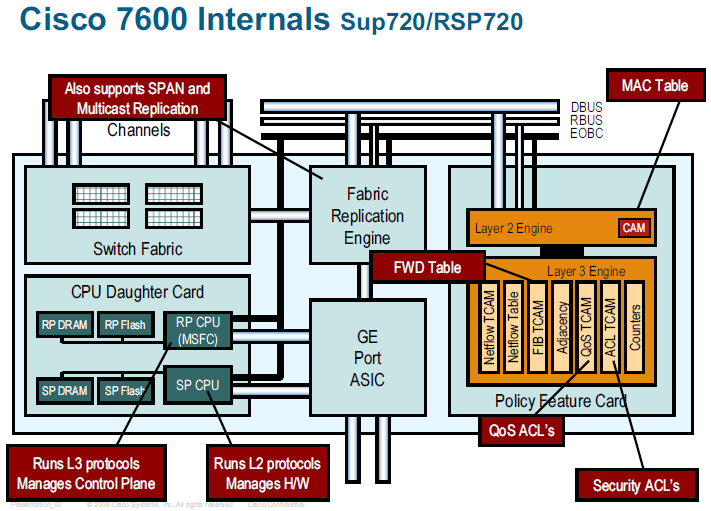 On the SUP720 and RSP720 (with EARL7) the Superman ASIC performs the layer 2 forwarding lookup operations and the Tycho ASIC performs the layer 3 forwarding lookup operations. 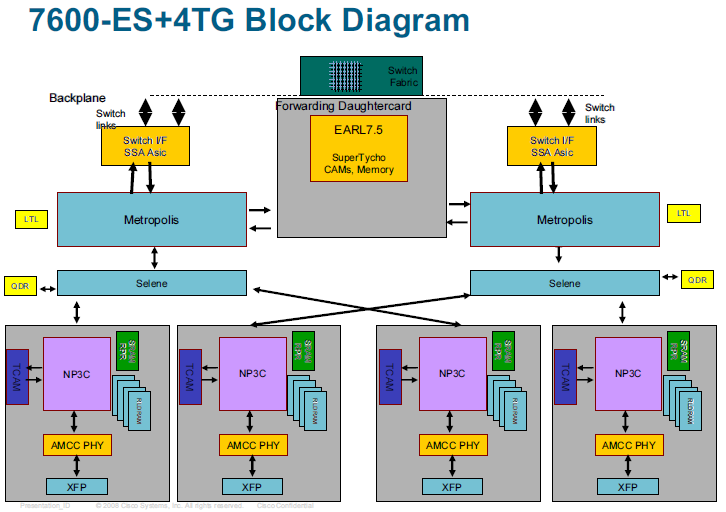 On the RSP720-3C/DFC3C EARL 7.5 is used, Superman and Tycho are one single ASIC called Supertycho so when performing an ELAM against the Superman ASIC Supertycho is presumably called as this seems to capture layer 2, MPLS and native layer 3 traffic. The link between Superman/Tycho/Supertycho and the SANTA_CRUZ / SANTA_MONICA ASICs is not clear. Also the KAILASH ASIC is actually an FPGA which has something to do with parsing RP and SP CPU punted/originated traffic. 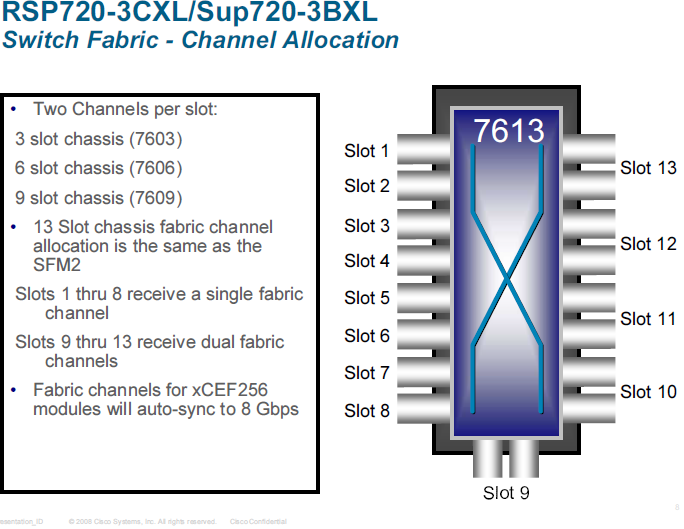 The TELESTO ASIC is something to do with fabric connectivity? For SUP2T the Eureka and Lamira ASICs form the EARL8 chip set and the layer 2 forwarding engine, Eureka is used for ELAM captures on SUP2T/PFC4/DFC4. Below are outputs from a few 7600s and 6500s showing each supervisor has one of either the SANTA_MONICA or SANTA_CRUZ ASIC.